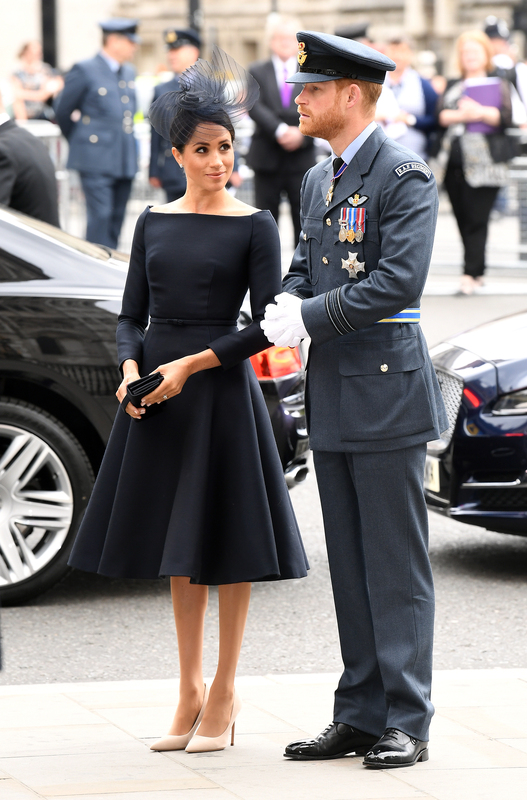 It appears the Duchess of Sussex is now fully into the swing of things in her royal working life, recently attending a poignant service at Westminster Abbey to mark the Centenary of the Royal Air Force. 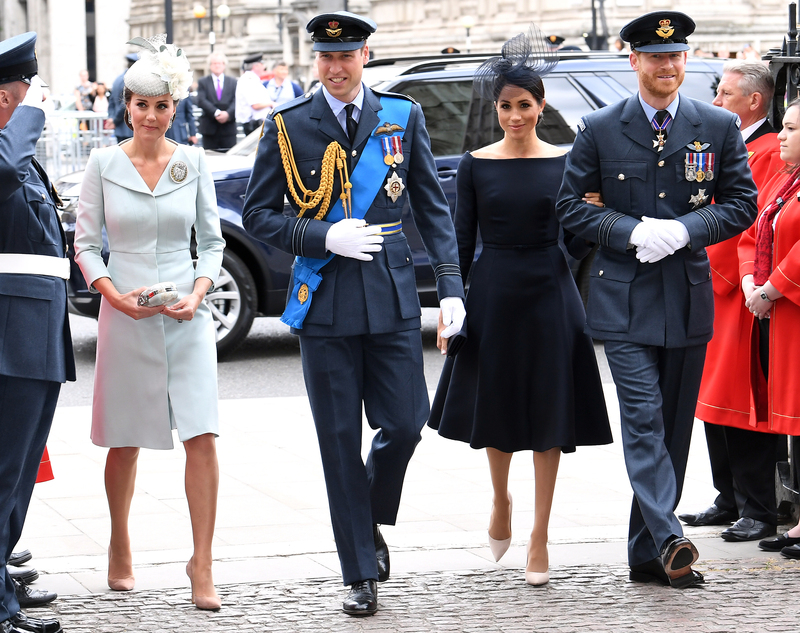 Meghan, Harry, and the Duke and Duchess of Cambridge – or as they are now dubbed, the ‘Fab Four’, arrived at the service together on Monday morning. The foursome were closely followed by Sophie, Countess of Wessex, and Camilla, Duchess of Cornwall and Prince Charles. And while the royal ladies all looked suitably elegant, eagle-eyed fans noticed that Meghan was the only one without a specific accessory – a glittering brooch. 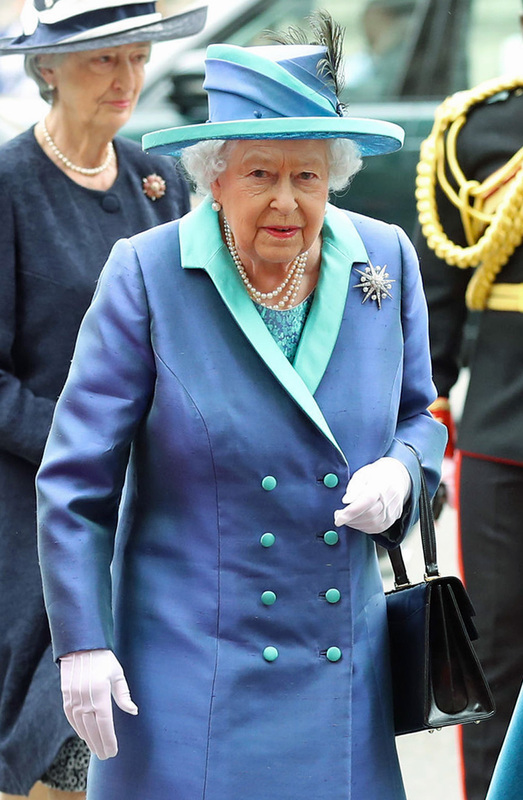 Catherine was wearing an impressive, large diamond Dacre brooch on her gorgeous Alexander McQueen suit, while the Queen decided upon her Jardine star brooch. 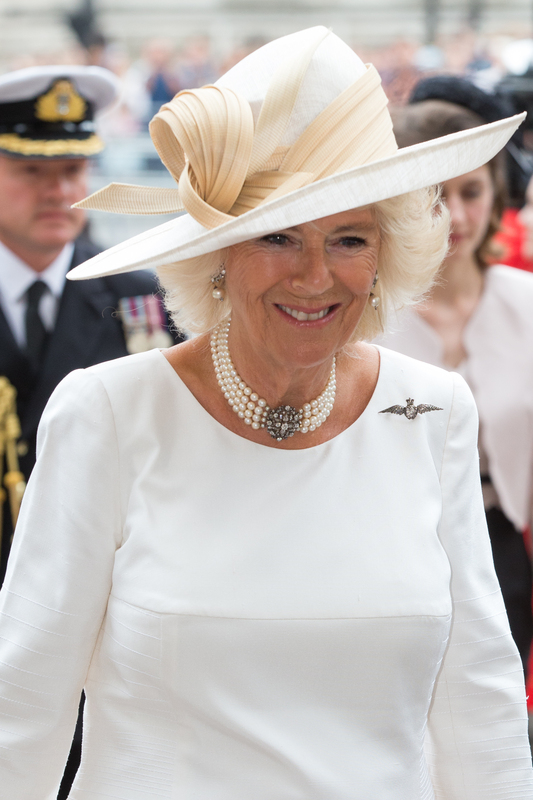 Camilla, as Honorary Air Commodore of RAF Halton, also wore her own RAF brooch, with Princess Anne doing the same, as Honorary Air Commodore of Royal Air Force Brize Norto. 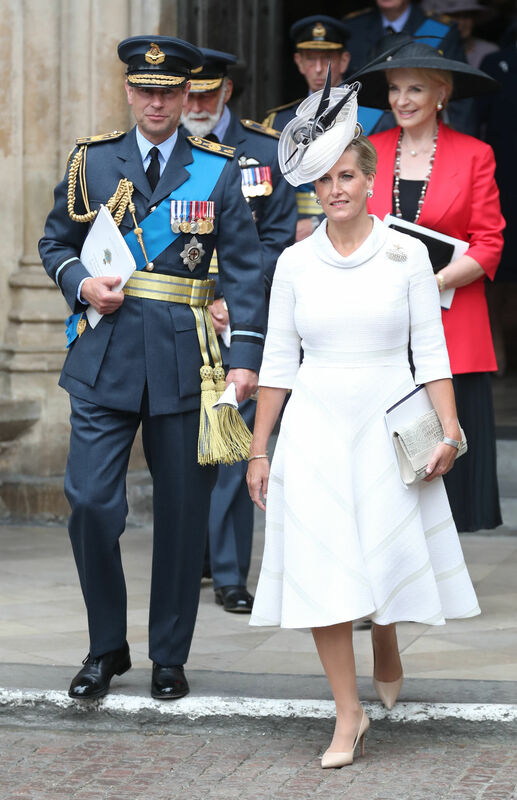 Sophie, Countess of Wessex wore her brooch too, as Honorary Air Commodore of HMS Daring, 5th Battalion, the Rifles (5 Rifles) and RAF Wittering. The royal ladies all wore their brooches to the poignant service as they all hold honorary positions with RAF squadrons or bases. Catherine was given her brooch as a gift when she was given the position as Honorary Air Commandant of the RAF – and it’s considered to be the highest award any female cadet can get. But Meghan was unable to wear one as, currently, she does not hold any position within the RAF, nor has she yet been given any honorary position within the organisation. Therefore, she does not yet own a brooch. 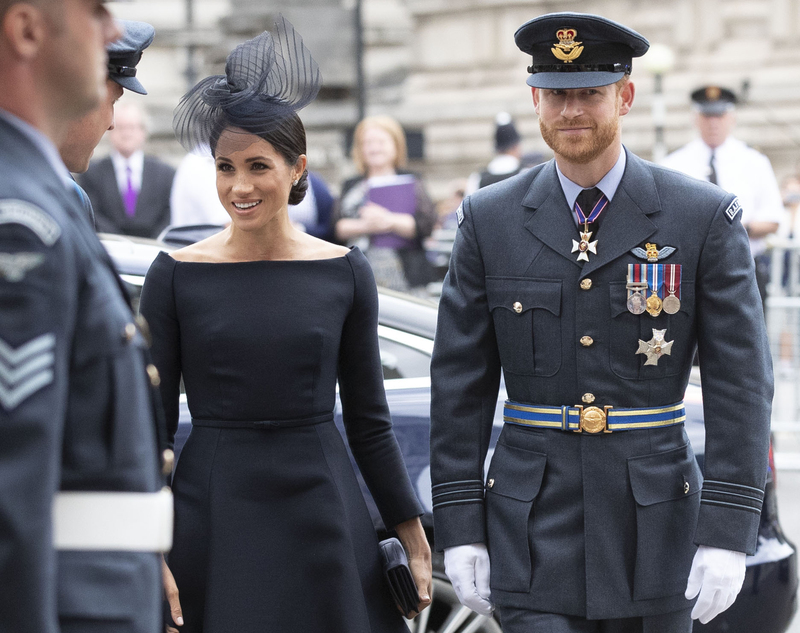 However, it’s thought that given Harry’s decade-long career in the army, the new Duchess will recieve the prestigious position and a matching pin before long. While Meghan was without the symbolic accesory for the ceremony, it seems all attention was still focused on the Duchess’ popular outfit choice. She opted for a dark navy ensemble with her now signature bateau neckline and a billowing skirt, perfect for the occasion. It’s reported that Meghan’s dress was bespoke Dior, as was her simple black clutch and her cream shoes. The Duchess of Sussex completed her look with an elegant navy Stephen Jones fascinator, and her favourite Cartier earrings. And the look appears to have gone down a storm with fashion fans, with many declaring it to be one of her ‘best’ yet. Royal watchers were full of praise for the elegant choice, sharing their thoughts online. Other fans wrote, ‘So so pretty! I love it’, and ‘She looks perfect!!!!’. High praise indeed! Prince Harry’s wife has certainly switched up her royal style since officially becoming a member of the family. Prior to her wedding, Meghan would usually favour messy buns and slouchy jumpers, coats and trousers. Now, the Duchess appears to be leaning more towards sleek, put-together hair-do’s, and tailored fitted dresses made to suit her silhouette. Would you say this is one of Meghan’s best looks ever? Following the service, Meghan and Harry jetted off to Dublin, Ireland, to begin their first royal visit since their marriage. There, they will meet with Government officials, visit Trinity College, and take a ‘moment for reflection’, at the cities Famine Memorial. They’ll then head back home on Wednesday evening. So get ready for plenty of impressive outfit changes from the Duchess!